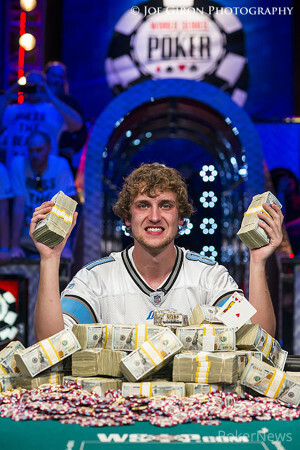 Ryan Riess Wins the 2013 World Series of Poker Main Event ($8,361,570)! The 2013 World Series of Poker Main Event has come to an end. Emerging victorious and winning the massive $8,361,570 first-place prize was 23-year-old youngster Ryan Riess after he defeated Jay Farber heads up for the most coveted prize in all of poker. For his runner-up result, Farber took home a proud $5,174,357. Back in July, 6,352 hopefuls took their seats in the 2013 WSOP Main Event, all vying for the richest prize in poker history. Among them were champions from the past, poker legends, dream chasers, and grinders from all over. It was then that Riess was just another young face in the field, but things would all change slowly over the course of the next seven grueling days of poker. Following Day 7, Riess was one of the famed November Nine, taking the fifth-largest stack into November. Eight more eliminations later and Riess was the last man standing. Entering the final table, all eyes were on chip leader JC Tran. He came into the final table with a large gap separating him and second place, but Tran's run ended in fifth place. You can read the complete recap of the first day of the final table here, but for now the lights are all shining on the Michigan kid. When heads-up play began, Farber had the chip lead by roughly 20 million over Riess. Quickly, though, Riess powered his way to the front with expert play and timely maneuvers. Every big pot seemed to be pushed the way of Riess, although there was one double up for Farber that extended play a bit. On that double up, Farber took his straight draw up against Riess' top pair in a clash on the flop. Spiking the straight on the turn gave Farber some extra life, but Riess didn't waver. He sat right back down and went back to work. The next thing everyone knew, Farber was short once again. On the final hand, Hand #261 of the final table, Farber was all in with the against Riess' . While Riess had a powerful hand in the confrontation, Farber had two very live cards and a solid chance at doubling up once again. Following the flop, Farber was looking for a five to stay alive. His queen would now give Riess a Broadway straight, and that would've spelled the end. The turn was the , leaving just one more card for Riess to dodge. The paired the board on the river, and the swarming began. Riess' rail stormed the stage, engulfing the new champion and piling on top of him. Chants of "Riess the beast!" rang loud throughout the Penn & Teller Theater, but Riess made sure to fight his way out of the pack and congratulate Farber on a job well done. Surely it was from Farber, as $5,174,357 is nothing to hang your head about. Overcome with joy, Riess hugged his railbirds one by one, grabbing his close family members a little tighter than the others, but nonetheless showing emotion with each person individually. He came into the final table believing he was the best player remaining, and he can now rightfully call himself world champion. Congratulations to Ryan Riess, the champion of the 2013 World Series of Poker Main Event! The Las Vegas poker pro bests Jay Farber in a heads up battle to claim $8.3 million and the coveted World Series of Poker Main Event Championship Bracelet. Ryan Riess had the button, and he raised to 2.5 million. Jay Farber reraised all in for 14 million, and Riess called. Farber tabled the and his tournament life was on the line against Riess' . The flop came down , taking away Farber's outs to a queen because it would make Riess a Broadway straight. The turn was the , putting Farber down to just one more card to double up and stay alive. The dealer burned one last time and dealt the ! 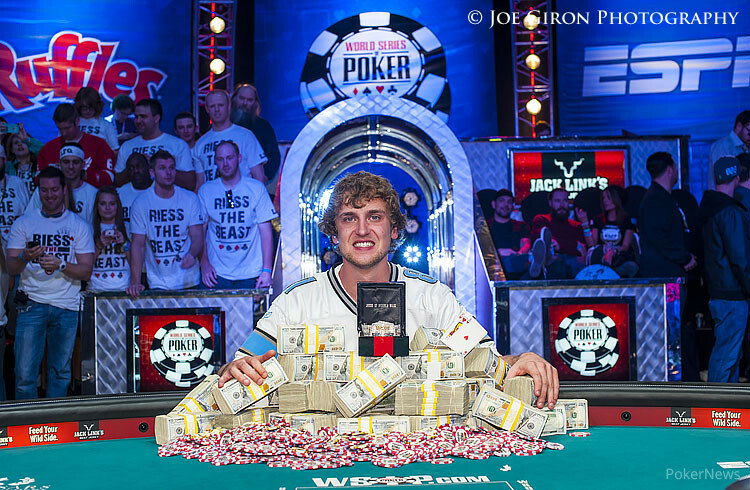 That proved to be the final card of the tournament as Ryan Riess has held on to become the 2013 World Series of Poker Main Event champion. 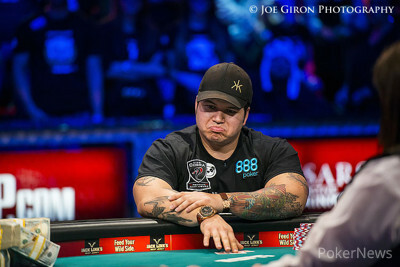 Farber finished in second place for $5,174,357 — a finish he shouldn't be disappointed with. Jay Farber had the button, and Ryan Riess received a walk. Ryan Riess had the button, and he raised to 2.5 million. Jay Farber moved all in for 12.1 million, and Riess folded. Jay Farber had the button, and he raised all in. Ryan Riess folded. Ryan Riess had the button and raised to 2.5 million to win the pot. Jay Farber had the button. Ryan Riess got a walk.